The AP120J4 is a multi-stage, pressure only air cleaner primarily used in conjunction with Garner Denver/Drum 450 blower applications, both truck mounted and stationary. The AP120J4 air cleaner has an integrated inlet design that requires no additional accessories. The 4″ OD outlet tube is well suited for applications up to 400 CFM. 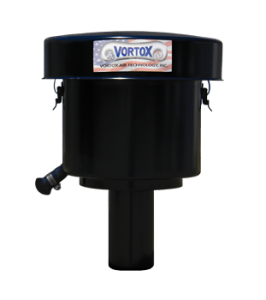 For mounting, use Vortox Air Technology BB120G Band Brackets. This Band Bracket is designed with a deep bracket to allow the inlet assembly ample side clearance from the frame rails. Constructed of 16 and 20 gauge Electro Galvanized Steel and finished with a durable polyester powder coat paint, the AP120J4 will provide years of service for many applications. The outer housing is constructed using Deep Draw Technology which ensures a seamless, one-piece construction of the body and head components.